Ugly Overload: Goodbye to the Chinese Paddlefish? What do you know--another tragedy out of China. 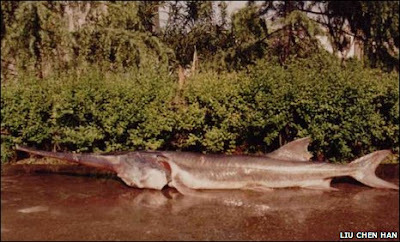 This one comes in the form of an expected recently extinctified (made up word) giant freshwater fish known as the Chinese paddlefish (Psephurus gladius). It used to haunt the mighty waters of the Yangtze River. These monsters measured in at around 21 feet long, but haven't been spotted in over six years, despite a recent survey conducted to determine their numbers, which look to be approaching zero. If the Chinese paddlefish is indeed gone, like the Yangtze river dolphin before it, then the title of the world's largest freshwater fish will be bequeathed to another, like the Mekong giant catfish or the arapaima of the Amazon river. But then, it's suspected that the paddlefish wasn't a true freshwater fish. Ready for new vocab word (for you non-ichthyologists)? Anadromous. That's when a fish lives most of its life in marine environments but then returns to freshwaters to spawn. It's thought that the Chinese paddlefish might have been (or is) anadromous. But not all is necessarily lost. Though the survey was three years long and the research team employed a variety of tactics to try to locate even a single paddlefish, it's quite possible that individuals eluded the researchers. The Yantze River system is immense and complicated, and there are any number of places where paddlefish, especially smaller ones, could still be found. But without intervention, things don't look good. I'm thinking that the dissemination of some good ol' misinformation might work here. Tell the fishermen on the Yangtze that hooking or netting a paddlefish will render them impotent for seven years, and we might find a resurgence in their numbers (I always suspect Traditional Chinese Medicine as being a contributor to an Asian animal's decline). Few people know that the original lyrics to Elton John's "Goodbye to Yellow Brick Road" was originally "Goodbye to Chinese Paddlefish". Why is that fish on top of the water? if they continue to hang out on top of the water, I would say their chances of survival are slim to none!